By Abigail Abesamis, The Daily Meal (Los Angeles Times) — Already a choice destination for outdoor activities-thanks to its close proximity to the Great Salt Lake and the Wasatch Range-Salt Lake City also has much to offer in its urban center, namely an outstanding food and drink scene that&apos;s getting national recognition, from award-winning chocolate makers to an underground speakeasy reviewed by the New York Times. Here&apos;s your weekend hit list of top spots that are elevating the city&apos;s gastronomic reputation. 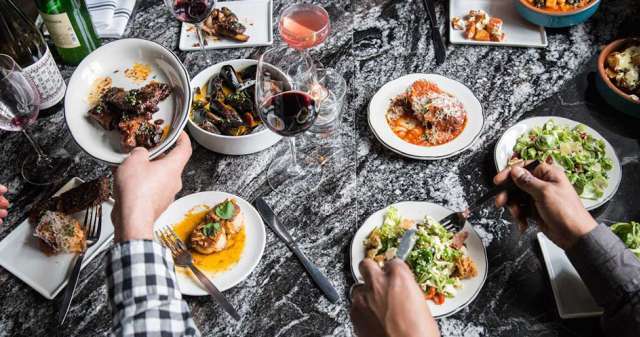 At this stylish Downtown bistro, chef Jonathan LeBlanc rounds out his menu of housemade pastas and standout small plates with a fully vegan menu that goes beyond simply removing meat and dairy items from the regular offerings. We love the pistachio pesto bucatini with vegetable consummé, ground pistachio, parsley, olive oil, garlic and shallots. Pair it with an Italian wine from Stanza&apos;s extensive list, one of their Negroni variations or an Italian soda. A neon green sign marks the entrance of this seriously cool subterranean speakeasy with a vintage vibe. On the menu are craft cocktails, including the appropriately named "Something Good" (vodka, Laird&apos;s Applejack, lemon, simple syrup, egg white, Honest John aromatic bitters), and modern American comfort plates. The chicken pot pie is wonderfully savory and filling, a shared entree made with celery heart velouté, wild mushrooms, swiss chard, sweet potato and a buttermilk biscuit crust. It&apos;s worth a visit for the ambiance alone, which was carefully curated by owner Sara Lund, who envisioned a welcome retreat for "the rest" of us. Sister to the Park City original, Handle Salt Lake (HSL) builds upon the original concept of updated, yet familiar, American plates to complement the Downtown dining scene. A killer brunch features vibrant dishes like the cinnamon bun topped with fruit and goat&apos;s milk caramel, General Tso&apos;s-style cauliflower with pickled Fresno peppers and sriracha vinaigrette, and pork sofrito and egg toast with goat ricotta and market greens. For a sweet treat, look no further than this all-vegan ice cream shop from the team behind two other plant-based concepts in Salt Lake City: Buds, a sandwich shop, and Boltcutter, a Mexican spot located next door. They&apos;re churning out a changing menu of small-batch ice creams, with flavors like cookies and cream (featuring cookie pieces and a cashew coconut base) and lavender vanilla served on housemade waffle cones. A full service espresso bar offers coffee drinks with plant-based milks. Stop by the taproom of Utah&apos;s first dedicated cidery for a taste of artisanal ciders made using local ingredients from the Mountain West region and named after canyons in Utah and Colorado. Desolation (6.9% ABV) is characterized by a subtly sweet melon flavor and a citrusy finish resulting from the addition of prickly pear juice in the final stages of fermentation. 25 cents of every bottle sold supports the efforts of the Southern Utah Wilderness Alliance, a nonprofit organization aimed at preserving America&apos;s red rock wilderness. This hip bar offers an extensive menu of handcrafted cocktails-from house concoctions to well-known classics-made with spirits lining a floor-to-ceiling liquor wall complete with a library ladder. Grab some tapas and a refreshingly tart Ruby&apos;s Rubicon featuring Woodford Reserve bourbon port, lemon, simple syrup, sarsaparilla bark, egg white, mint and sparkling white wine. See what&apos;s on tap at Wasatch&apos;s Sugarhouse brewpub, an offshoot of the Park City original (the first brewpub in Utah) from the first brewery in the state. The Snap Down India Pale Lager (4% ABV) is a medium-bodied brew with a hoppy nose. The self-proclaimed "food nerds" at Caputo&apos;s know their wine, cheese, chocolate and more, and pass on this knowledge to customers at themed tasting classes. Their most popular class focuses on craft chocolate, which delves into what makes artisanal chocolate a premium product and how it compares to what we find on the mass market. It introduces participants to chocolate makers in Utah and beyond that are creating top-notch bars and demonstrates the complexity of flavors that can be achieved with just the right beans and fermentation processes. This huge, high-tech arena is home to the NBA Utah Jazz and in addition to basketball games hosts major concerts (with Lady Gaga, Pink and The Killers scheduled to perform) and other shows like Disney on Ice. You can get there by hopping on the TRAX, Salt Lake City&apos;s light rail system-it&apos;s a free ride to the arena and to many major points Downtown. Offering a variety of classes from spin to yoga to Pilates, this chic boutique fitness studio is the perfect place to refocus, find your center and get your body moving after indulging in the stellar food and craft drinks Salt Lake City has to offer. Luxe guestrooms and suites with bold, playful accents lend a unique vibe to this centrally located boutique hotel in Downtown Salt Lake City. It&apos;s a welcome retreat after a long day on the slopes or exploring the local area, complete with a daily wine reception hosted in the living room lobby and an on-site restaurant and bar.